The I. Physics Institute of the University of Cologne is participating in a close international collaboration with the Max-Planck-Institute for Astronomy in Heidelberg and the Osservatorio Astrofisico di Arcetri for the design and development of LINC, the LBT INterferometric Camera. LINC will operate at optical wavelengths ranging from 0.6µm to 2.45µm and will make full use of the adaptive optics and interferometric capabilities of the Large Binocular Telescope (LBT). Due to the special optical layout of the LBT, which resembles a Fizeau-interferometer with two 8.4 meters primary mirrors at a constant baseline of 14.4 meters, LINC will offer an exceptional and so far unprecedented combination of wide field of view (15 to 120 arcseconds depending on the used detector array and the performance of the complex adaptive optic systems), high angular resolution (9 milliarcseconds at 1.25µm) and large collecting area (110 m²). While other astronomical interferometers (e.g. VLTI or Keck I & II) - either already operational or currently under construction - will reach higher angular resolutions, their field of view will be less than one arcsecond and too small to help answering many interesting questions. The special imaging capabilities of LINC will therefore be of great importance for scientific progress in astrophysical fields which need observational data with high spatial resolution over a wide field of view. 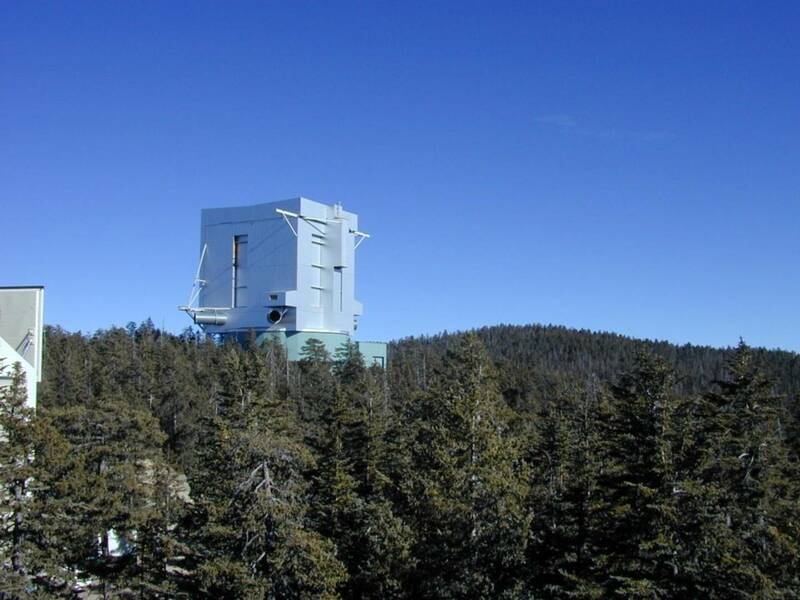 The Large Binocular Telescope is located on Mt. Graham, Arizona (USA), and is build and operated by an international consortium of several universities and research institutes at the United States of America, Germany and Italy. Currently the individual parts of the complex telescope system are under construction at the respective institutes. According to current schedules the first light of the telescope with one primary mirror is planned for spring 2005 and full interferometric operations should be reached later in the same year. As can be seen in Fig. 1 the enclosure of the telescope on Mt. Graham is already mostly finished, with the remaining work concentrating on its interior. Fig. 2 shows a picture taken during the pre-erection of the telescope structure in Summer 2001 at Ansaldo Inc. at Milan, Italy. 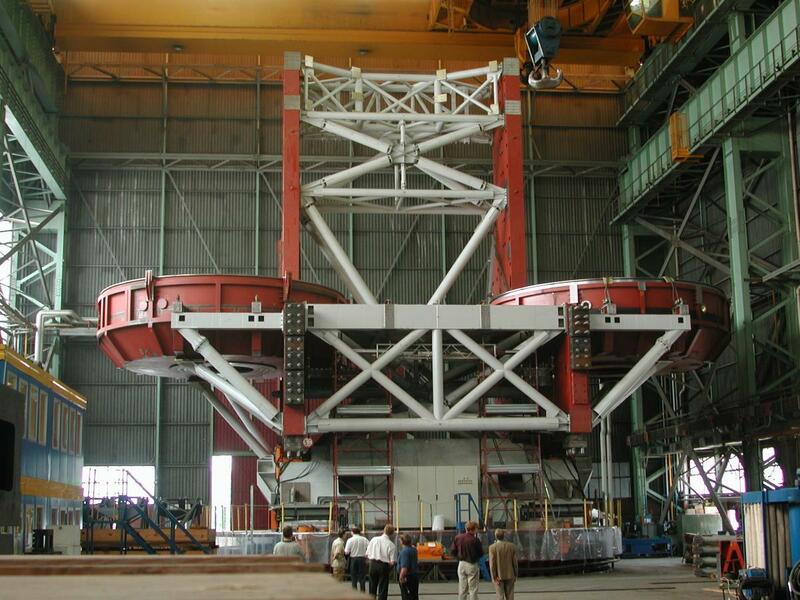 This test assembly included most parts of the mechanical structure and the electrical drive system of the telescope to confirm the specified operation and interaction of the individual components and to measure and analyse detailed flexure parameters. The telescope system was fully steerable during this test-erection.